GIBRALTARIANS have good reason to remember the 10th of September – the day the Rock turns red, white and proud all over. And although the iconic National Day balloons – banned on environmental grounds – will be conspicuous by their absence for the party’s 25th edition, the celebrations are rising to the occasion like never before. Live music, fireworks and beer by the barrel load are all set to mark Gibraltar’s most important day of the year. And, almost 50 years on from the first referendum when Gibraltarians voted overwhelmingly to remain British, the Rock is standing taller and prouder than ever. Ironically, another referendum has given this year’s celebrations added impetus. Britain’s Brexit result came as a blow to the Rock but in the true die-hard spirit associated with this tiny limestone outcrop in the Med, it has been business as usual and what threatened to shatter the Rock has only made it stronger. The resolute way Chief Minister Fabian Picardo has confronted the threat at home and abroad since June 23 can make all Gibraltarians proud! Now, with Spain still knocking at the door, this year’s National Day is a chance for Gibraltarians to fly the flag and show the rest of Europe that, in the Union or out of it, there is nothing more solid than the Rock. The abundance of local pride has seen the former one-day event spill over into more than a week of celebrations – including music of all genres, arts, food, photography, competitions, a political rally – plenty to bring locals and tourists alike into the street and onto their feet. It’s a chance to demonstrate to the world that there really is nowhere quite like Gibraltar, and no nation quite like its people. And as tense political times fuel the fire in Gibraltarian bellies, this year’s festivities will be a statement as well as a celebration. Passion truly makes this party… and organisers expect more than 30,000 revellers to join the celebrations. But before the ‘big day’, the celebrations kicks off with a bang and a drum roll at the now legendary Gibraltar Music Festival (GMF). Spanning two days for the second year running, the event on September 3 and 4 will see internationally renowned acts, including Stereophonics and Bryan Ferry, starting the party in style. The GMF is regarded by many in the music industry as the finale to the global summer festival programme. Symbolically held on the ‘hallowed turf’ at Victoria Park, the UEFA newcomers’ national football stadium is another example of how little Gibraltar punches way above its weight. “There is always a real buzz around Gibraltar in the build up to national day,” explains 25-year-old Irish expat Michael Hayes, who commutes daily from La Linea. “I love working here and, as always, I am really looking forward to National Day. 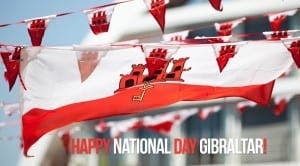 The National Day festival is a mix of looking back at Gibraltar’s proud history; and looking forward, celebrating the business opportunities, innovation and future building plans for this modern peninsular. Organised by the Self Determination for Gibraltar Group in conjunction with the Ministry of Culture, the celebration commemorates one of the most important moments in Gibraltar’s history: the referendum of 1967, when citizens had a say on their sovereignty for the very first time. On that day, a landslide 99% of Gibraltarians voted to remain British. Today they are just as, if not more, impassioned under the constant taunts of their Spanish neighbour. Following the EU referendum, acting Spanish Foreign Minister Jose García-Margallo poured petrol onto the flames of an already volatile fire by demanding joint-sovereignty of the Rock. But the stance of Gibraltar and Britain couldn’t be more clear: back off, Jose! And while Gibraltar is like a stick of Brighton rock – red and white all the way through – there’s also a vein of Union Jack blue. Gibraltar is proud of its status as a British Overseas Territory under a British sovereign for more than 300 years. The Queen may not have made an appearance since 1954 but, three years ago, with the Gibraltar flag flying over the Foreign Office in London, Prime Minister David Cameron joined the celebrations in spirit, rallying his loyal troops from a giant screen in Casemates. “For 300 years we have stood together, as one with our shared sovereign. Let me assure you that the British people and my Government stand with you now. Our relationship is solid, sure and enduring,” he proclaimed to roars of approval. These sentiments are increasingly important to Gibraltar in the light of recent international tensions, played out through the media. But Gibraltar has said ‘enough is enough’ to one-sided Spanish news reports. A high-profile victory against Spanish newspaper ABC was the start of the Rock’s fightback against years of ‘slanderous’ comments. As lawyer Charles Gomez says, if the rabid right-wing Spanish press is to be believed then Gibraltar is ‘a cocaine-fuelled, money-laundering playground run by the barbary apes’. And what better day to do so than on National Day? It’s about a party, not a political party, but it sends a message, loud and clear, in the best possible way. The day itself kicks off with a political rally at midday followed by speeches and toasts in Casemates Square. After a summer of stunning weather, an open-air concert was a no-brainer for organisers. Children’s activities, live music and DJs will also keep the crowds entertained at other locations, including King’s Bastion Leisure Centre, Victoria Park and John Mackintosh Hall. Stick around for the grand finale at midnight when fireworks light up Casemates, before the party moves on to the late bars and clubs surrounding the square. With the eyes of the world’s media focused on Gibraltar, the Rock will also use National Day to strut its impressive stuff. Not only its national football squad but its new university, spectacularly sited at the southernmost tip of Europe, and top British private college Prior Park which opens its fourth school on the Rock this autumn. Quality education is as much of a priority as big business, enabling Gibraltar to attract and nurture top talent from around the world. The gambling industry, one of Gibraltar’s most lucrative sectors, is also pushing on with a number of top firms committing their future to Gibraltar, even in the face of Brexit. The World Trade Centre, a project that has cost tens of millions of pounds, will be unveiled next to Victoria Stadium in the coming months – yet another example of Gibraltar’s refusal to rest on its laurels as it continues to innovate. The WTC will become a global hub, strengthening Gibraltar’s focus on finance, transport, banking and internet gaming. So while National Day has history at its roots, it is also a celebration of the peninsula’s future. If there was ever a time to stand up and fly the red and white flag with pride, that time is now. Gibaltar is not a nation, and she can´t not be independent because it goes against the territorial integrity of Spain. Shared sovereignty for Gibraltar would be a smart way to let Great Britain execute their Brexit while staying forever in the EU market. Harming Gibraltar residents in these ways, would also do immense harm to the thousands of Spanish people who rely on earnings gained there. It’s called, “cutting off your nose to spite your face” Anselmo. There is probably an equivalent saying in Spanish? If not, you would do well to adapt this one. In Spain the equivalent expresion is ” to remove an eye to another person in exchange for to become blind”. But we must not forget that some activities of the gibraltarian economy can be perjudicial for the Spanish economy. The best news in this report is, the doing away of those damned balloons. For this Gib, the turtles, dolphins, tuna and even cows thank you.